Other times, Haddon went with friend Judy Pepper Klein or by herself. “Day baseball at Wrigley Field,” she exclaimed. The White Sox, much closer to Chatham at old Comiskey Park than the long CTA ride to the North Side, had lost Haddon for life. 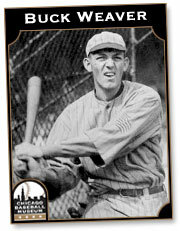 Sorry, Chuck Comiskey, the Allyn brothers, Bill Veeck and Jerry Reinsdorf, you missed out on a superstar fan. Carol Haddon and I started our journey outside the Starbucks in the new multi-purpose mini-skyscraper that houses the Cubs’ expanded front office. The building exists on the site of former car wash, the north end of the huge “Red” parking lot that once tried to charge $50 for its close proximity to the ballpark. The closest place to fetch coffee then was the Yum-Yum Donuts stand, home of the breakfast if (would-be) champions of Cubs teams of yore. Now the area south of the building is the attractive Park at Wrigley that includes the grass field on which kids can romp and an outdoor plaza to enjoy those Starbucks coffees, many transformations in composition and price from Yum-Yum’s java. Next we go through three levels of ballpark operations people to process our tickets and vet us for MLB-mandated security. All are friendly and welcoming, and I’m sure they were like that before their Cubs training. The vetting includes all metal items, so I have to take off my watch to put it in the tray. If one arrives near gametime, you might miss a few batters given the multi-step way to getting into the ballpark. Once in the main concourse, Haddon busied herself greeting a bevy of vendors who worked the portable stands dispensing everything from beer to bison dogs. The portables soon will be cleared in favor of permanent facilities whose windows were closed at that moment. The Cubs believe the constant concourse clogging will be alleviated by the closing of the portable stands, all on one side of the supporting pillars. But many of the vendors seemed fearful whether they would be retained once the stands closed. There was conjecture long lines would form at the permanent, embedded stands. We moved on to the Audi Club, once the Stadium Club, Wrigley Field’s oldest in-house eating-and-drinking venue dating back to the early Tribune Co. ownership days of the 1980s. It serves as pre- and post-game gathering place located on the south side of Wrigley Field, just west of Gate D, at the corner of Addison Street and Sheffield Avenue in the right field corner. Our server Cindy, a longtime veteran, took care of us quickly with quesadillas. Talk among the veteran fans was how the Stadium Club will close after this year in favor of expansion of the long-neglected, very cramped visitors’ clubhouse. More expensive and swanky private clubs are opening under the Ricketts family ownership, but it did not sound like the longtime Cubs fans would join with the cost not too affordable. I had many memories of ballyhooed arrivals of new Cubs players and managers revealed in the Stadium Club — but very few departures. Dallas Green announced his shocking exit here late in 1987, his organizational rebuilding job uncompleted and then virtually trashed by the penny-pinching corporate Tribune crowd. The soon-to-departed Stadium Club hosted Ryne Sandberg’s first retirement in 1994. Ryno was accompanied by the sight of then-wife Cindy in her famed corncob-pattern sundress. Press conferences in those days at the Stadium Club had free hot lunches for media, cut out as the 2000s proceeded. Carol Haddon and I then made our way through the narrow box-seats aisle around from right field, most of the ushers greeting Haddon after their off-season parting like the long-absent friend she is. We passed the location of her original seats by the visitors’ on-deck circle. Haddon made many big-league friends there, including Ozzie Smith and Pete Rose. Hit King Rose who was very skilled at tennis and was an avid doubles player Rose along side his agent-attorney Reuven Katz. Haddon was an athlete, too, having been a mid-1950s tomboy playing football against the guys. She could also handle a racket. On a trip to Cincinnati, Haddon and a partner matched up against Rose and Katz on the court. They lost. Of course there was a re-match. Haddon and Co. won. Rose might have been Haddon’s all-time No. 1 favorite if he had not held out so long admitting his gambling sins. Other favorites were outfielder Garry Maddox, who came out to watch daughter Julie Haddon’s New Trier softball game, and Cubs-turned-Giants-turned-Pirates third baseman Bill Madlock. “Playing third base, Bill could always find me (by the visitors on-deck circle) because I was the darkest person there — I always tanned,” she said. Haddon lost her on-deck circle vantage point in the mid-2000s. Amid the first 3 million attendance Wrigley Field season, the Cubs of course lusted after more pricey seats. The team build Rows A, B and C in front of Haddon’s Row 1. 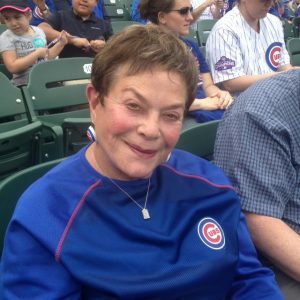 She had the choice of maintaining her $40-per-game seat or upgrading to $250 a game buckets. “I wrote (then-business chief) Mark McGuire and (president) Andy MacPhail,” Haddon recalled. McGuire at least respected her seniority. He called back soon and Haddon was quickly re-located in the first row behind the Cubs dugout. She was a bit cramped initially, but she got to know a bevy of players who’d stand up watching the action a few feet in front of her. Haddon now pays $13,000 a year for each seat, a fraction of the price of the new Club 1914 section across the aisle. From that viewpoint, Fox cameras spotted Haddon with eyes glistening standing on Oct. 22, 2016 as the Cubs were about to book their first World Series trip in her tenure as a fan. The prime-time shot was the proverbial picture saying a thousand words, all you needed to know about the life of a Cubs fan starting out in the mid-20th century. Now, on an April weekday with pleasant temperatures at game time, Haddon wanted to take a better measure of her seats next to the re-built dugout, Row 1, Seats 103-104. Her viewpoint is above the camera where NBC Sports and WGN’s cameras show the ground-level home-plate shot. Cubs photographer Steve Green also is stationed in the well. Newly constructed netting protects the seats from foul liners. When someone in the well wanted to flip a foul ball up to the folks behind us, they did an underhanded toss to clear the bottom of the netting up over our heads. No wonder Cubs players and manager Joe Maddon had some issues with the final construction of the long, deep dugout. The floor is seven steps down from the field, the south entrance below us relatively narrow with handrails on each side. Perched with one foot on the third step, the top of Maddon’s head was even with the top of the low fence protecting the dugout. Haddon caught Maddon’s eye in greeting for a second just before the first pitch. He’s a good Joe with longtime fans. “I was so shy,” she said of her younger days, but Haddon has gotten over such reluctance. 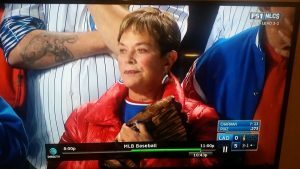 “Anthony, I miss you!” she yelled at a disabled first baseman named Rizzo when he got within earshot. And when Javy Baez briefly appeared in the well, Haddon called out, “Javy, that was a nice day,” meaning his two-homer outburst the night before. Baez did not look up. The new dugout is so big third-base coach Brian Butterfield stood just a few feet from the top of the steps. When he moved toward home plate as a runner churned toward third, fans in the Club 1914 seats could literally reach out and touch him. On this day, with the best weather forecast of the opening week at Wrigley Field, less than half the seats, stretching around home plate toward the visitors’ dugout, were filled. The absent fans reminded of field-hugging, unoccupied $2,000-per-seats at Yankee Stadium at the bottom of the Great Recession in 2009. Even the super-wealthy will pick their spots to watch live baseball in the 21st century. Someone in the game-production department watched a vintage-1969 home-run video. When Kyle Schwarber homered against the Pirates, a ’69-style WGN simple “Hey Hey” graphic quickly grew larger as Schwarber rounded the bases as if Jack Brickhouse was yelling his home-run call. Unlike her ’69 favorite aces, Haddon does not go the distance. She bails after the eighth inning to beat traffic. That provided me an opportunity to check around. All the construction has provided an unusual exit strategy for box-seat fans. Going into a tunnel, the fan walks down some steps, goes on an even plane for a few feet with mysterious doorways spotted, then goes upstairs to the main concourse. Once the game ended, traffic is blocked off on both Clark and Addison for a time period post-game, for security reasons. Most shocking site were at least two Chicago police officers in battle gear cradling automatic weapons in the middle of Clark. Concrete blocks also are set up along the north side of Addison next to the ballpark to prevent cars from jumping the curb. Terrorism is on everyone’s mind. But the cops’ fears are not allayed just keeping cars away from the ballpark on both the arterial streets and the ugly parking lot-turned-into-the Park-At-Wrigley. One officer pointed at the new luxury Hotel Zachary on the west side of Clark and shook his head. Apparently, all the open windows, balconies and ledges provide a new risk, from idiots dumping objects onto the street at the least to the unthinkable worst. Suddenly, one had the feeling of wanting to walk in with Haddon on her first game in 1971, when she paid $3.50 for her seat, the cops merely directed traffic outside and 24-win Cy Young Award winner Fergie Jenkins completed 30 of his 39 starts, including six complete-game losses. This was future shock.